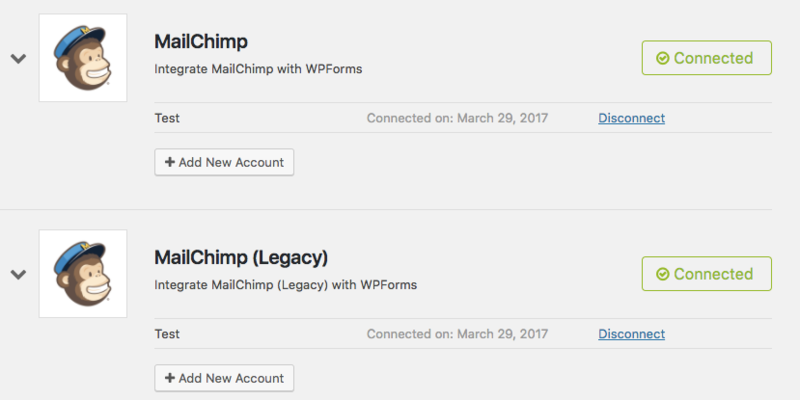 Are you using MailChimp and WPForms for your email marketing? The WPForms MailChimp addon makes it incredibly easy to create signup forms with our drag and drop form builder. Recently MailChimp released a more powerful integration API, v3.0. In order to make sure that this release doesn’t affect your signup forms, we’ve updated our MailChimp addon to work with the new API. We’re asking that our MailChimp addon users please update the addon and register the new MailChimp integration so that your signup forms continue to work as expected. We renamed the old integration to MailChimp (Legacy). The new integration is called MailChimp. The process for creating a new MailChimp integration is exactly like the previous one. Here’s how you can update your integration. The first thing you’ll need to do is update your WPForms MailChimp addon by opening Dashboard » Updates. For more details see this guide on how to install updates in WordPress. Once the update has completed, you’ll need to go to WPForms » Settings, then select the Integrations tab. On this page, you’ll notice that there are two MailChimp listings: MailChimp, which uses the new API, and MailChimp (Legacy), which uses the old API. To connect your account though the new API, you’ll need to open the MailChimp listing and click on the + Add New Account button. To find your MailChimp API key, follow these steps. After you’ve added your account, you’ll get a green box that says “Connected”. 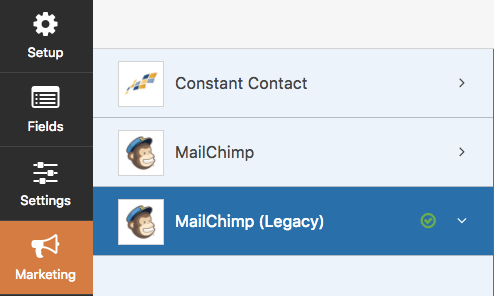 It’s best to also leave the MailChimp (Legacy) account connected for now, as we will need to transfer extra information inside your forms next. Now that you’ve connected the addon to MailChimp’s new API, you’ll need to copy the settings within individual forms to a new section so they can use the new API as well. To do this, open the form builder for any form utilizing the MailChimp addon and go to Marketing. You’ll notice that there are now two MailChimp connections, MailChimp and MailChimp (Legacy). MailChimp (Legacy) contains all of your existing settings for the old API. To transfer these to the new API, select MailChimp and Add New Connection. You’ll be prompted to enter a nickname for the form, and then you’ll be taken to the settings page. From here, you can click back to MailChimp (Legacy) to copy any settings you had set up for this form. Once you’ve copied any existing settings from MailChimp (Legacy) to MailChimp, you can delete the settings for the deprecated API. To do this, return to MailChimp (Legacy) and click on the red ‘x’. Be sure to save your form, then go ahead and repeat this process for any forms that have a MailChimp connection. Now that all of your form settings have been transferred to the new API, we can delete the deprecated connection. To do this, return to WPForms » Settings, then once again select the Integrations tab. If you open MailChimp (Legacy), you’ll see a Disconnect link next to your account. After clicking this link, your site will be disconnected from MailChimp’s deprecated API. The MailChimp (Legacy) option should disappear from this page (you may need to refresh the browser page). That’s it! You’ve now transferred your forms to MailChimp’s new API. That’s all for this update, but there’s more coming soon. Don’t forget to subscribe to our email newsletter to be the first to know. Thanks once again for all your support and feedback in making WPForms the best drag & drop form builder. Unfortunately it doesn’t work – when I enter my API and Name and click on “save”, the button just changes to “Saving …” and gets stuck there. Nothing happens even after a couple of minutes. Is that a mailchimp issue, or something wrong on your part? Thanks for taking care of that! I apologize for the trouble. There was a bug in the v1.1.0 release that gave some issues trouble like you are describing. We’ve already released an update (v1.1.1) which resolves the issue. Once you update it should work as expected. Thanks! I haven’t yet received any update for WPforms – when can we expect this to arrive on WordPress 4.7.3? This update was made available when this post was published, and should be visible under Dashboard » Updates. If the update does not appear for you, could you contact us in support? From there we can work with you can to see what’s going on, and manually update the plugin if needed. Not sure why, but when I try to add a new API key into the new Mail Chimp integration it just spins and spins and spins. Doesn’t ever save. Any help?? Oops! Just saw the above comment. Thanks! Hi, I have a brand new install for wpforms and for the mailchimp addon v. 1.1.1, but when I hit the “connect to mail chimp” button, it stalls and does nothing. What settings do I need to check? That means in your MailChimp configuration inside WPForms, there is a field that is set as “required” in MailChimp that you have not mapped in your form. If a field is not mapped, then the lead won’t be able to submit to MailChimp since it’s required. Check out https://cl.ly/0w0Q0I0z3221 – in this example the sometext field is set to required in MailChimp (see the red asterisk). Make sure all fields that have that asterisk have a field mapped to it.